London, United Kingdom—Norway’s Magnus Carlsen will seek to cement his reputation as history’s greatest chess player on Friday when he launches a defense of his crown against the first US title contender since Bobby Fischer in 1972. Both Carlsen—a 27-year-old superstar at home who is also a part-time model —and 26-year-old Fabiano Caruana are prodigies returning mass appeal to their highbrow game. The world title will go up for grabs in a former London school of art and design whose sweeping glass dome and imposing columns have featured in a recent series of fashion shows. It is a fitting venue for Carlsen. The champion since 2013 has also been one of the faces of a street-smart Dutch apparel brand since 2010. But the chess world is more enthralled with Carlsen’s intuition and prodigious memory than his rugged looks. “There is no doubt that Carlsen is one of the best chess players ever,” British Chess Magazine editor Milan Dinic told AFP. The Norwegian won his third world title in a series of rapid play tiebreakers against Russia’s Sergey Karjakin in 2016 in New York. His first came when he toppled Viswanathan Anand on the former champion’s home turf in India. Carlsen defended his crown in a rematch played the subsequent year in Russia. But he really began making a name for himself when he managed to draw Garry Kasparov—the Soviet and Russian legend whose record ranking Carlsen eventually broke—at the tender age of 13. Carlsen actually beat Kasparov’s compatriot and nemesis Anatoly Karpov at the same event. He has spent a good part of his time since then making chess fun again. Carlsen took time off preparations for the London series to play an exhibition game against the Liverpool football team’s chess-loving right-back Trent Alexander-Arnold. The 20-year-old rising star lost, but can console himself with the knowledge that he held out against Carlsen for nearly twice as many moves as Microsoft’s Bill Gates. 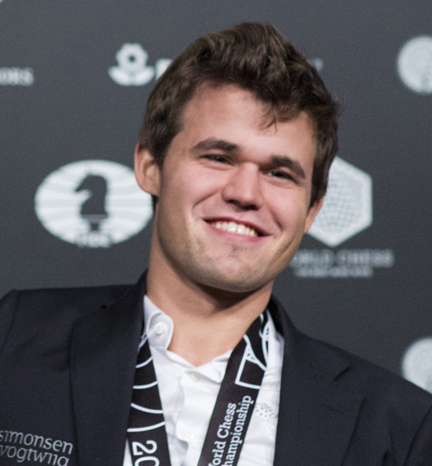 Carlsen has succeeded in “removing the stigma associated with chess,” championship organizer Ilya Merenzon told AFP. “He’s not a nerdy looking male and he’s not just another Russian chess player,” said Merenzon. What Carlsen has done for the global game, Caruana is achieving in the United States. Americans have not had a chess hero since Fischer stunned Soviet champion Boris Spassky in an epic series in 1972 that epitomized the Cold War rivalry between the two superpowers. Now, US media is fascinated with the possibility of the chess title coming home nearly 50 years later. Caruana has the credentials to become another chess sensation in the 12-match series that plays out over the coming weeks in London. The Italian-American from Miami has played for both countries and became a grandmaster at 14. He earned his shot against Carlsen by winning this year’s Candidates Tournament in Berlin. And his climb up the FIDE chess federation’s rankings to the number two spot has taken him within just three points of Carlsen’s total of 2,835. “Caruana had an amazing 2018 which gives him a lot of vigour ahead of the match,” said British Chess Magazine’s Dinic.